Yet another one of my grandmother's treasures has found the likes of me. Every visit to my grandparents house (the hoarding grandmother, not the bookworm one), she'd have us bring out bin after bin of jewelry to pluck from. "I have no use for them anymore, take what you please," she'd always say. Some of it would be costume jewelry that's still considered costume nowadays, earrings without their pairs, and broaches so gaudy I wondered why they were fashionable, but there's always at least one new thing I'd find at every visit that's gorgeous in a timeless way. 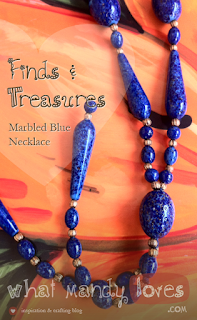 This blue marbled necklace is one of those timeless pieces. The beads catch the light illuminating the marbling and hints of gold swimming through the waves of blue. 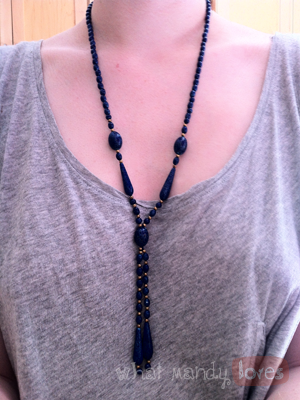 It's long chain rests the beads over any shirt calling to be the center of attention. It's pieces like this one that make me kick myself for not asking her the story behind it. I never really asked about any of the jewelry unless she saw something worth talking about. This one I don't remember her fond over when I pulled it out of a bin, but nonetheless it was treated with care and must have been complemented on in its time out of the bin.